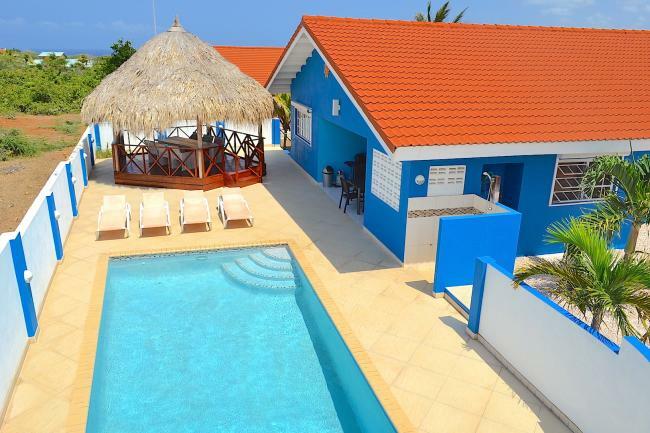 Villa Blou Curaçao, centrally located with views over fields and hills, and even further the sea. Kashutuin is a cozy little hidden 'courtyard', a well-kept secret, very central to the island. 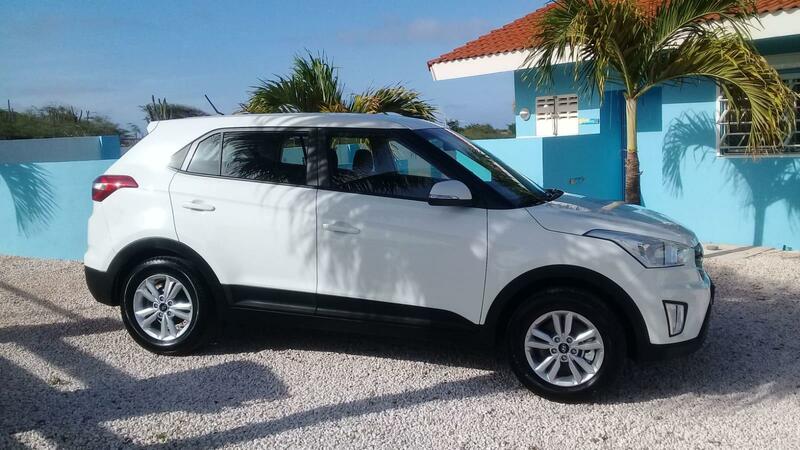 To explore the island to the max, we rent out two very affordable new Hyundai Creta SUV (September 2018) incl. all-risk insurance, and a very convenient Ford Explorer (7-seater) incl. liability insurance, all cars for the very competitive price of € 45 per day! Contact ons voor de beschikbaarheid. This detached holiday home (plm. 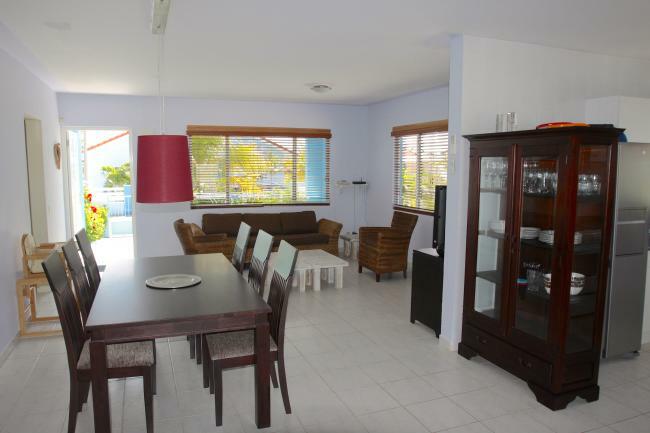 150 m2) with three bedrooms and two bathrooms and stands on a plot of 665 m2. 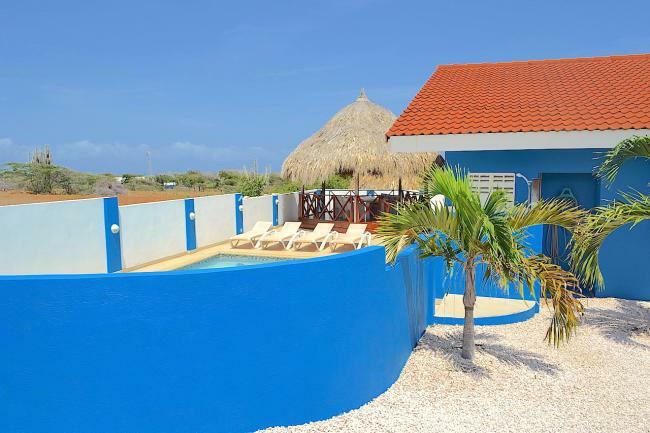 It has a cozy palapa with views over nature. Parking is possible on site. 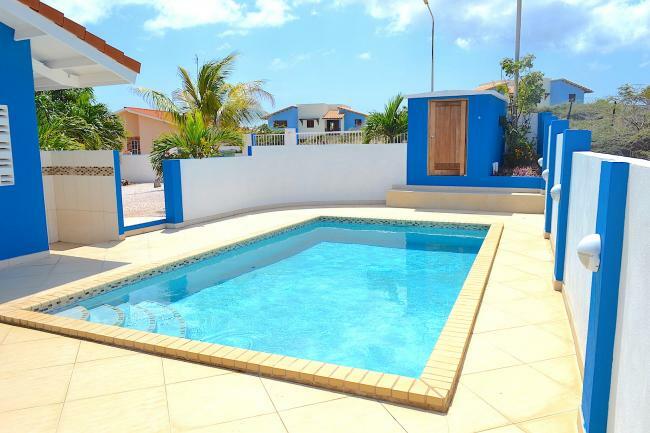 The inhabitants of the district, both Dutch and Curaçao, are our (and also your) friends who will assist you with advice and advice.Its central location makes it easy to go to one of the beaches or the city. Diving schools, restaurant, supermarket, it's all in your neighbourhood. In addition, nature is also around the corner. The flamingos are within two minutes, but the great nature park Christoffel Park can be reached within a few minutes. Villa Blou stands on a plot of over 665 m2 of private land. 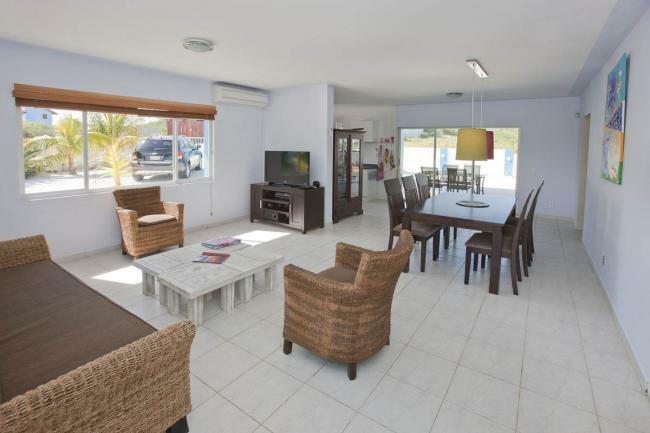 After a period of long term rental it is now fully renovated and refurbished. 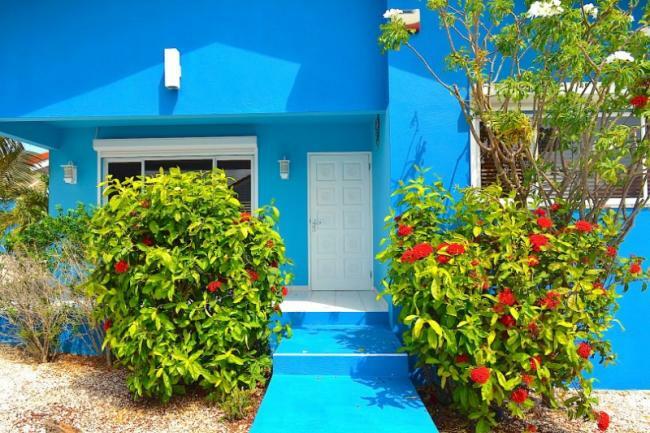 On Curaçao, there is a great deal of living outside. There is a very spacious garden with tropical plants, mango-, bananas- and palm trees. There are also plenty of places to enjoy the whole day of the sun. 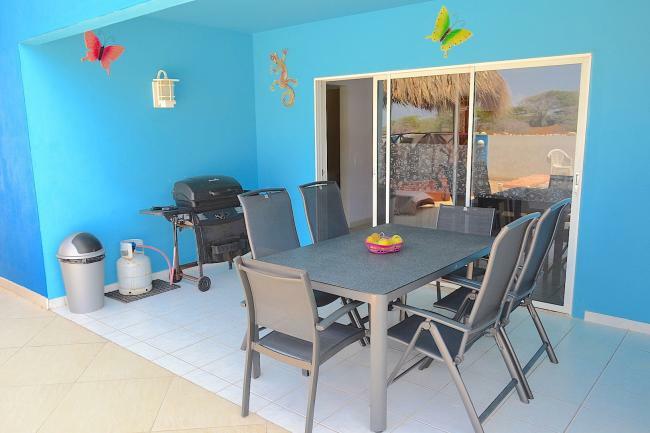 At the front is a spacious porch, where you can enjoy the sun and tropical birds from your 'lazy chair'. At the back of the villa there is a large terrace where it is very pleasant to have a meal. In addition to a dining table in the covered back porch, a large cozy palapa is lovely on the wind. From here you will see the terrace and swimming pool as well as the landscapes and hills. Also here is a large dining table where you can enjoy your meals outdoors. There is also the private swimming pool and sun terrace, which offers a lot of privacy by its location. The temperature of the bathing water varies between 28º C and 31º C.
The pool is equipped with color-changing lighting that creates a fairy-tale atmosphere in the evening. On the sun loungers you can enjoy your well-deserved rest. Due to its relatively high position, the north-east passes for a delicious cooling breeze. The villa has a large living room (also equipped with air conditioning!) and a spacious kitchen equipped with all comforts. There are 3 bedrooms. The largest, the master bedroom, has a private bathroom. In the master bedroom is a double bed. The other 2 bedrooms share a bathroom. The bedrooms are equipped with single beds (box spring mattresses). All bedrooms have a split-unit airco. For the little ones there is a baby-/toddler bed and a high chair. Furthermore, Villa Blou has a large flatscreen TV in the living room incl. Dutch (you can even watch your favorite tv show back for 1 week), German, English, French, Italian, films and sports nets, DVD / CD-installation, an "American" double door refrigerator, a 5-burner gas stove with oven, extractor hood, safe, dishwasher, washing machine. The whole house is largely provided with shutters, which makes it very easy to keep it cool. 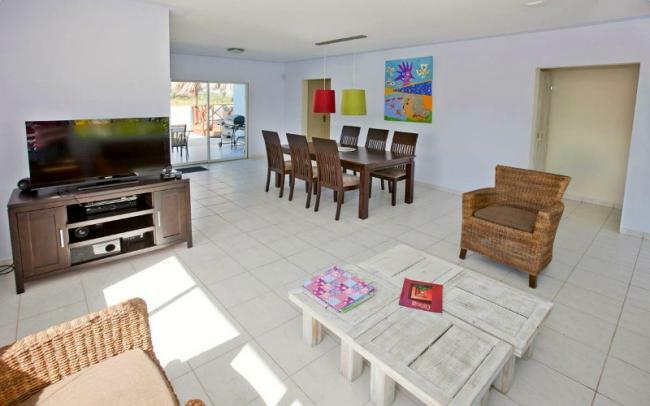 By combining this house with our other Villa Amarilla house, which is only 50m away, we can accommodate 12 people (and 2 babies). Nice for a family holiday! The basic price is € 79,- (excl. 7% lgb) for use by 2 persons. Each next guest costs only € 10,- (excluding 7% lgb) extra. Free stay for children up to 2 years, including free use of cot-chair and car seat. - Car rent Hyundai Creta SUV incl. all-risk insurance or Ford Explorer incl. liability insurance for € 45.- p.d. On Curaçao, the costs for water and electricity are relatively high. One m3 of water costs € 7,-. Elektra costs € 0.38 per kWh. By keeping these costs out of the rent, you have an influence on the holiday expenses. By limiting the use of the air conditioning to the moments in which you are in the refrigerated room you are already saving a lot of costs. The usage of electricity and water will be deducted from your deposit. We can arrange a taxi from and to the airport. The price is USD 30 per ride, to be paid directly to the driver. Kashutuin is very centrally located on Curacao. At the height of the famous Landhuis Daniel you leave the main road and head towards beaches. The 'Kashutuin' court consists of about 35 houses and is somewhat hidden just behind the main roads, in the countryside, the 'real' Curacao. The Landhuis Daniel restaurant is within three minutes. The supermarket and a bakery are just a few hundred meters further in the village of Tera Kora. The most beautiful beaches including Porto Marie and Daai Booi are closest to us in just 7 to 8 minutes. Here you will also find diving schools and restaurants. On the coast you will also find the most beautiful diving sites in the world! Also other beautiful beaches (Cas Abao, and more, Grote and Kleine Knip, Lagun, etc. ), bays and dive sites are close by. 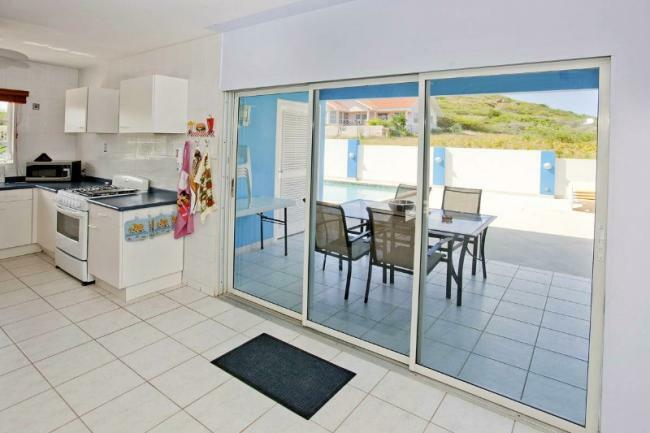 You will also find an 18 hole golf course with sea views at Blue Bay, Julianadorp and St. Michiel. The flamingo colonies and the saltpans are 'the corner'; You will be there within minutes. There you can also visit one of the oldest country houses of Curacao: 'Jan Kok', nowadays inhabited by sister of the recently died artist Nena Sanchez, who has her gallery. 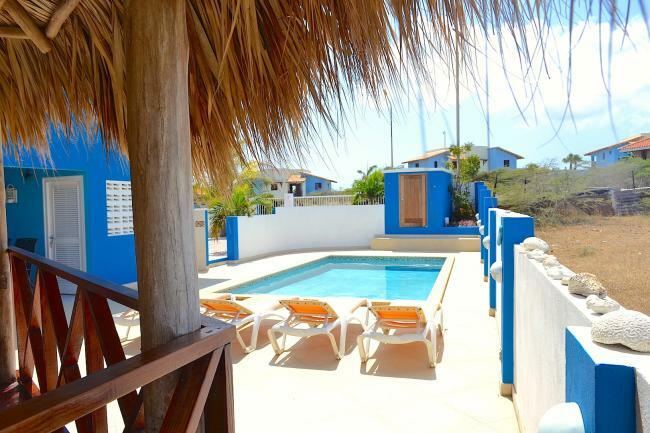 The neighbourhood is about 20 minutes drive from Willemstad city center with Otrobanda and Punda, with many shops, restaurants, the famous pont bridge and Fort Amsterdam. Even closer (15 minutes) is the new mega shopping center Sambil. The airport is a 15-minute drive from Kashutuin. 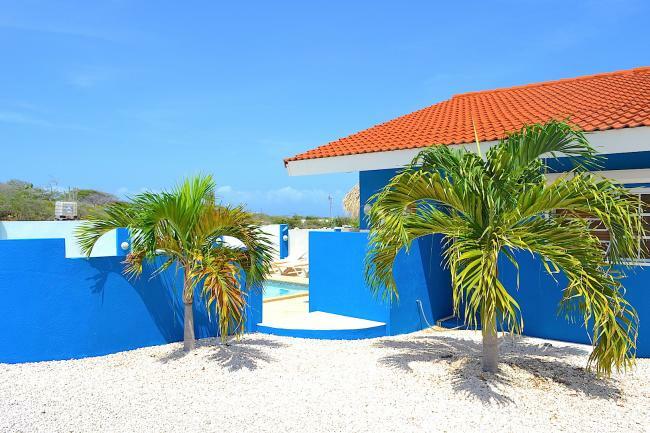 The central location makes it possible to get to the city center (Willemstad city center) as well as visit the westernly located Christoffel Park Nature Reserve or Shete Boka National Park.